FirstEnergy’s Ohio utilities face challenges that they overpaid for renewable energy credits and passed the excess costs on to consumers, but confidentiality claims make it hard to know how much money is at stake. Environmental groups and the Office of the Ohio Consumers’ Counsel say the utilities’ “unreasonable” and “imprudent” management decisions distort the cost of renewable energy in the state. The confidentiality claims are especially contentious because some of the alleged overpayments went to the utilities’ unregulated affiliate, FirstEnergy Solutions. The utilities say the information should stay confidential for competitive reasons. The Public Utilities Commission of Ohio (PUCO) will review appeals from confidentiality orders in the case as it decides the merits of the challenges. Meanwhile, bidders’ names, numbers of credits, and purchase prices are all blacked out in public versions of briefs. Case testimony contains numerous redactions too. A preliminary analysis by the Natural Resources Defense Council (NRDC) estimates the amount of excess payments ranges from $96 to $126 million. The NRDC calculations rely on an independent financial audit by Goldberg Schneider, which said FirstEnergy’s Ohio utilities charged “significantly higher” rates than other Ohio utilities. The utilities charged customers between 5 and 6 times as much for renewable energy as the next highest regulated utility in Ohio. The draft of another audit report by Exeter Associates had recommended denial of all costs above $50 per credit. That came out after FirstEnergy reviewed the draft. Exeter Associates’ final report says the utilities paid “unreasonably high” amounts for the credits. The public version provides no dollar value for how much is at stake. “I don’t know,” said FirstEnergy spokesperson Doug Colafella, when asked about how much money the case involves for the companies. He did not believe the utilities had any ballpark estimate that was publicly available. The pending case concerns non-solar “all renewable” energy credits bought by Toledo Edison, Ohio Edison, and the Cleveland Electric Illuminating Company from 2009 to 2011. FirstEnergy owns all three utilities. FirstEnergy is also the parent of FirstEnergy Solutions, which owns and operates several power plants. Ohio’s renewable and alternative energy portfolio standard requires that by the year 2025, 25 percent of the electricity sold within the state shall come from alternative energy. Half of that energy must come from in-state sources. Separate requirements also apply to solar and other “all renewable” energy. Since 2009, companies have had to meet benchmarks towards that goal. Utilities can meet the law’s requirements by producing the required renewable energy themselves or by buying renewable energy credits from others. A renewable energy credit—sometimes called a renewable energy certificate or REC—represents the environmental and social benefits from generation of one megawatt hour of electricity from a renewable resource. 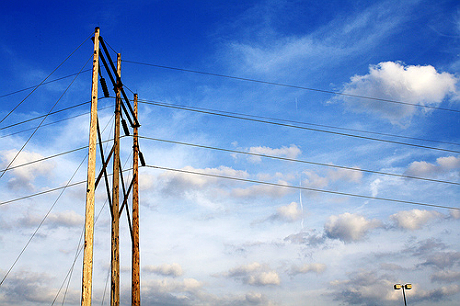 The utilities in the PUCO case don’t generate any electricity—renewable or otherwise—themselves. After Ohio’s legislature passed an electric choice law in 1999, FirstEnergy separated its electric power plants from its distribution utilities. As a result, FirstEnergy’s Ohio utilities routinely buy electricity from FirstEnergy Solutions or other suppliers for their customers who don’t choose their own generation company. As of late 2012, that “non-shopping” group had roughly 840,000 customers. Similarly, the utilities buy electricity or credits to meet renewable energy requirements for that group. Four requests for bids sought to buy in-state credits from 2009 to 2011. Only one or two successful bidders won contracts from each request. “There were bids awarded to nonaffiliated companies, as well as our unregulated affiliate, FirstEnergy Solutions,” says Colafella. “The FirstEnergy Ohio utilities should have been aware that the prices bid by FirstEnergy Solutions reflected significant economic rents and were excessive by any measure,” says the Exeter Associates’ audit. In some cases, the prices were more than 15 times the $45 per credit penalty the companies would otherwise have had to pay for failing to comply with the law. “FirstEnergy’s Ohio utilities have been in compliance with the law” since it went into effect, stresses Colafella. The utilities’ brief doesn’t dispute that prices paid were higher than those available from other states, or even those available now in Ohio. High prices were expected in a “nascent market,” the brief argues. It says such prices encourage other suppliers to enter new markets. Challengers argue that the FirstEnergy utilities should not have paid unreasonably high prices for the credits and passed them on to customers as they did. “FirstEnergy made several purchases at extremely high prices and failed to avail itself of alternatives that could have significantly reduced those costs,” says the PUCO staff’s brief. The public version of the brief by the Office of the Ohio Consumers’ Counsel doesn’t mention the name “FirstEnergy Solutions.” However, the agency clearly seems to criticize the utilities’ related party dealings. “It was a win-win decision” for the utilities, but “a no-win situation for customers,” says the brief. Briefs by the PUCO staff, Ohio Consumers’ Counsel and the Environmental Law and Policy Center, Ohio Environmental Council, and Sierra Club also argue that the utilities had other choices. The utilities did not consult with the PUCO before buying the credits. Nor did they seek a force majeure determination that the credits were not reasonably available (force majeure refers to unanticipated conditions that prevent someone from fulfilling a duty). The briefs also argue the utilities could have paid the $45 per credit alternative compliance payment instead of buying credits that cost up to 15 times more. However, under Ohio law, reasonable payments to purchase credits can be passed on to customers. Alternative compliance payments cannot. “The Companies made the decision to purchase over-priced RECs…, sticking FirstEnergy customers with the bill,” says the environmental groups’ brief. The utilities’ brief claims that other avenues would not have relieved them of their legal duty to buy credits. “We still would not have purchased the renewable credits, and we would have been in violation of the law, which is not the way we do business,” says Colafella. “If the RECs are available in the market and the price tag does not exceed the cost of traditional electric generation by more than three percent, then we are required to purchase the RECs,” adds Colafella. Challengers all want FirstEnergy’s Ohio utilities to give up any excess amounts they may have charged customers. While the utilities argue that the PUCO can’t do retroactive rulemaking or require refunds, the PUCO staff and other challengers say the commission can and should disallow any excess costs. Disallowed amounts might be credits against future bills. Dan Sawmiller, a policy analyst for the Sierra Club’s Beyond Coal campaign, adds that not all of the costs have been recovered yet. The utilities are still collecting charges for 2009 to 2011 because last summer they revised their overall rate plan, called an Energy Security Plan. Among other things, the revisions spread out charges for renewable energy credits. Consequently, residential customers’ monthly payments for the credits have dropped. Previously they were up to $4.80 per month. For 2013, they’ve ranged from $0.65 to $1.54. On the other hand, those spread-out charges include interest. “The real impact is that the customers pay more at the end of the day,” says Sawmiller. The Ohio Consumers’ Counsel and the environmental groups also want the PUCO to investigate further and impose penalties. Otherwise, they say, cost recovery and reimbursement wouldn’t be enough to deter similar action in the future. The Ohio Consumers’ Counsel says state law allows penalties up to $25,000 per day. The cited statute allows those penalties if a PUCO investigation finds that a utility has unlawfully given an undue preference or advantage to an affiliate. The environmental groups and Ohio Consumers’ Counsel also want the PUCO to require disclosure of all relevant facts and figures. Otherwise, Sawmiller and others fear customer payments could present the wrong picture about the real, reasonable costs of renewable energy. Ohio lawmakers are currently reviewing alternative energy issues in hearings under Senate Bill 58. “We think that a lot of information in this case needs to be made public to allow our legislators to make informed decisions,” adds Sawmiller. The Ohio Environmental Council, Environmental Law and Policy Center, Natural Resources Defense Fund, and Sierra Club are members of RE-AMP, which also publishes Midwest Energy News. The author lives in the area served by FirstEnergy’s Ohio utilities. Kathiann M. Kowalski is a freelance journalist based in Ohio who writes often on science and policy issues.